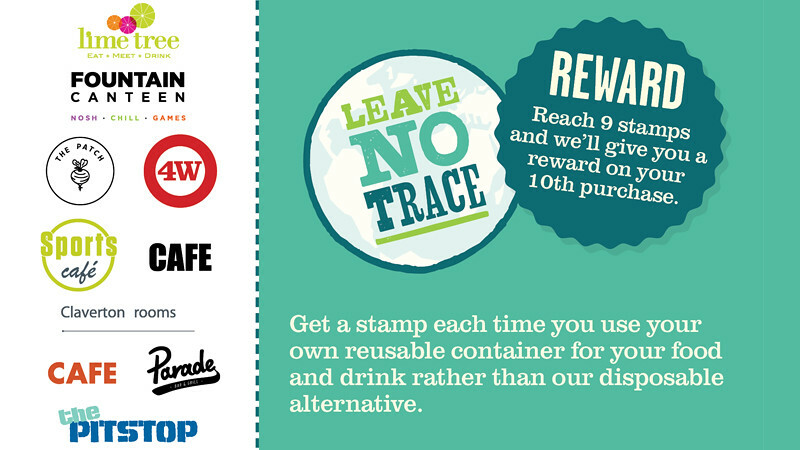 Use the Leave No Trace loyalty card to get money off food and drink in the University's hospitality outlets. The Leave No Trace loyalty card has been introduced to help the University reduce the amount of waste we send to landfill. Students, staff and visitors are all able to use the loyalty card. When you use a reuseable container to buy hot or soft drinks, or takeaway food, we'll give you 20p off your order and stamp your card. You could use tupperware containers for food, your own cups or mugs from home for hot drinks. We also sell Leave No Trace containers or reusable Keep Cups in our hospitality outlets and Fresh shops. We give all first year students staying in catered or part-catered accommodation a free, reusable Leave No Trace KeepCup. When you collect nine stamps, you will get £2 off your next hot drink, soft drink or takeaway food order if you bring a reusable container for it. Make sure you read the Leave No Trace loyalty card terms and conditions. If you are hosting an event and ordering food and drink from Food Direct you can receive a 5p discount for every person who brings a reusable cup.